The Ducks have pitching weapons in reserve. The heavy and light arms will have to continue to move Oregon forward until the punchless offense decides whether they are committed to the “small ball” approach of years past or if George Horton has decided to blaze a new trail for the second half of the year. 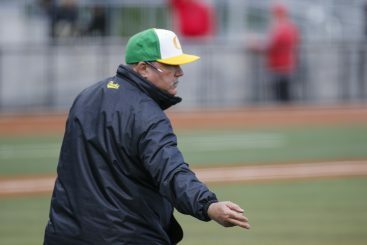 Coach Horton is considering changing Oregon’s approach at the plate. Optimism about surging bats and momentum carrying from game to game or series to series is not going to win baseball games. The staple of Oregon teams in the past – pitching and defense – will. 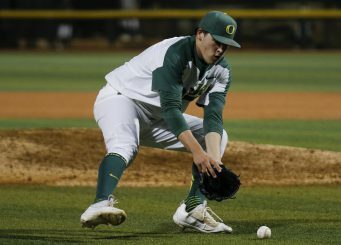 Although a mid-week matchup with Portland was called in the top of the ninth with Oregon leading, 3-1, there were a number of interesting items that point to the importance Horton is placing on his relievers. Horton sent eight pitchers to the mound on Wednesday, presumably attempting to find a replacement for Isaiah Carranza who was pulled after just .2 inning of work with a muscle strain, in the rubber match against Cal. Cole Irvin had a chance to work out the kinks he had against Cal, giving up a hit but striking out two in his single inning of work. Of course, no one was really worried about Irvin. Every pitcher runs into bad starts, it doesn’t matter how good you are. Just take a look at David Price or Zack Greinke. Carranza hasn’t been particularly dominant, posting a 4.37 ERA and 7:8 walk to strikeout ratio. But he has been a workhorse, making spot-starts and delivering much needed long relief for the recovering Matt Krook. Bullpen management is as important to the sport as ever, and the Ducks have grown accustomed to having an above average group of middle relievers. Warren has emerged as a solid option out of the pen. It appears Kyle Robeniol will replace Carranza for long-relief, but the most exciting reliever not named Stephen Nogosek is Brac Warren. The 6′ 4″ sophomore already has 10 appearances in 2016, just four less than he had all last year. His 1.35 ERA bests even Nogosek’s and is second to only David Peterson’s 1.30 mark. I don’t want to look too far ahead, but if Warren continues to produce at this clip, the Ducks have a replacement for Nogosek should he leave at the end of his junior season. Outside Carranza, Warren and Nogosek, however, the pen is a grab-bag of questions and developing arms. No other reliever has appeared in more than nine games. Cole Stringer and Matt Mercer lowered their ERAs by adding innings to their lines against Portland. Stringer has made only three appearances and tossed just two innings. Even if we aren’t particularly worried about Irvin and the rest of the starters, they have all begun to show signs of wear and tear. 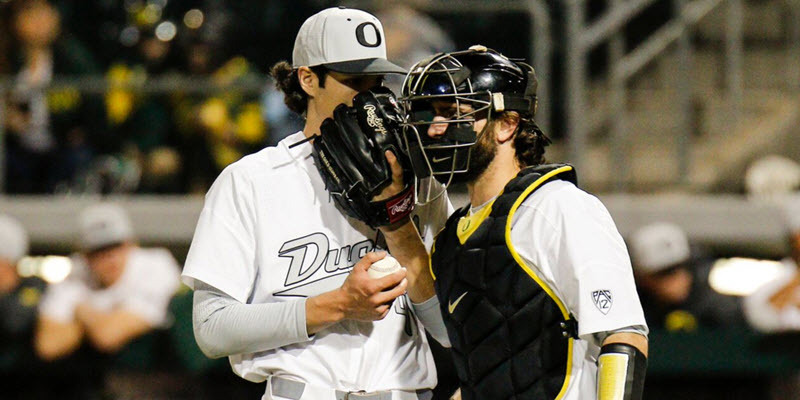 The Ducks kept themselves in the national conversation last year on the backs of the relievers. They opened 2016 with a bang thanks in large part to the performance of Nogosek – a Team USA member last summer. If they plan on playing into June, the bullpen is going to have to find its form.